Since this site first reported on the situation in Syria, the rebel Free Syrian Army (FSA) has continued to gain ground against the government of President Bashar Al-Assad. As February began, Assad's forces were wrapping up their campaign to reclaim the Damascus suburbs with a final victory in Douma; however, since then the uprising has continued to spread. In the north, FSA fighters solidified their control of Idlib city, and later took the nearby town of Saraqib. Meanwhile, as the government shelled disobedient neighborhoods in the central city of Homs, the rebels achieved a major victory in neighboring Qusayr, yesterday securing full control of the town. In the south, parts of the city of Daraa have also reportedly fallen to the FSA. 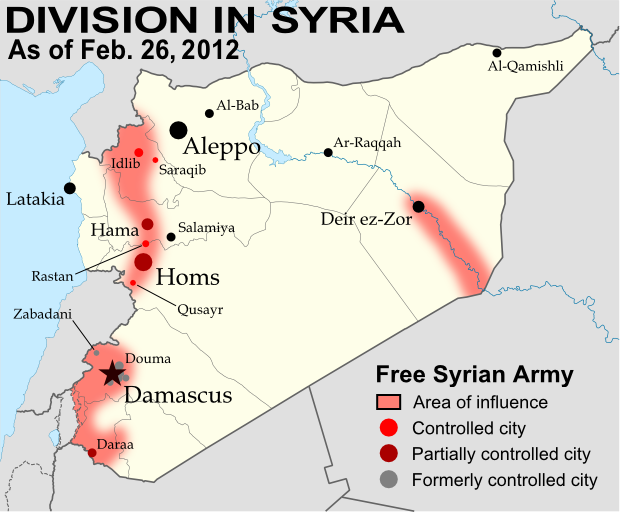 Two other changes to this map are corrections reflecting what was already the situation at the beginning of the month: (1) parts of the central city of Hama have reportedly been under FSA control since January, while (2) the rebels have reportedly been active in the eastern region of Deir ez-Zor since at least the end of last year. You can see the corrected version of the first map, along with the original report and background information, at the Syria Divided by Armed Conflict article.